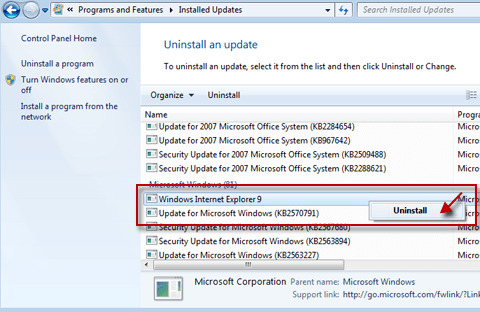 Downgrading Internet Explorer from 9 to 8 is a feature “hidden” from view in Windows 7. Since there isn’t a download available for Internet Explorer 8 in Windows 7, the only way to revert back is through the “View Installed Updates” menu inside Control Panel -> Programs. You can remove IE9 and install IE8 using the following steps. 4. In the Tasks pane, click View installed updates. 5. In the list of installed updates, double-click Windows Internet Explorer 9. Once Internet Explorer 9 has been uninstalled from your system, the computer will require a reboot. After rebooting, your computer should now revert back to Internet Explorer 8. To disable IE8 or IE9 in Windows 7, go to Control Panel -> Programs. Click on the “Turn on Windows Features on or off” link. Uncheck Internet Explorer 9 (or Internet Explorer 8). The system will then act as if Internet Explorer is no longer installed. You can re-enable it via a simple checkbox.